Foreword by Klaus Ottmann. Text and interview by Wendy Grossman. Over the course of a two-year period, photographer Brain Dailey traveled across the country with the objective of capturing individual portraits of the uncelebrated American electorate. From Jackson Square in downtown New Orleans to the open range in Texas, he organized impromptu photo shoots with more than 1,200 citizens, including those with no interest in politics or voting. In the portraits each individual expresses their personal identity casually in dress and pose, while their political identity is a chosen backdrop: blue for Democrat, red for Republican, grey for Independent, green for the Green Party and orange for those who don’t vote. 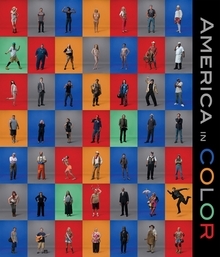 The resulting monograph, Brian Dailey: America in Color challenges our perceptions of the components and individual characters that shape the American political process. Hardcover, 12 x 14 in. / 336 pgs / 300 color.